Seeking to calm anxiety in business circles about his election as his country's first left-of-center president in recent history, Costa Rica's President-elect Luis Guillermo Solis says he won't join the Venezuelan-led ALBA bloc of radical leftist countries, and that he sees himself as a "moderate" who is "not unlike many recent European and U.S. leaders." But in an extensive interview, Solis - who takes office May 8, and will preside over the Community of Latin American and Caribbean States for the remainder of this year - vowed to diversify his country's foreign policy, which he says has been too focused on the United States. "I have always called for Costa Rica's foreign policy to be as universal as possible, " Solis told me. He added that previous Costa Rican presidents "have not looked south, and I want to do it," referring specifically to his intention to "intensify" with Brazil, Latin America's biggest country. "Costa Rica will not become part of the ALBA bloc, but will continue to have very good relations as it has had until now with ALBA-member countries," he said. "I am not afraid of having good relations with many of these countries." Solis, a former diplomat and international affairs professor who was a research associate at Florida International University's Latin American and Caribbean Center in Miami in 1999, will take office on May 8 amid growing economic and political uncertainty in his country. Soon after his April 6 election by a landslide following the withdrawal of his main rival from the race, U.S. chipmaker Intel - whose assembly and testing operation in Costa Rica had long been the country's main showcase to attract high-tech industries - announced it will partly close its operations in Costa Rica, laying off 1,500 employees. Hours later, Bank of America announced it will close a call center in Costa Rica, laying off 1,400 people. To make things worse, foreign investment in Costa Rica's free trade zones has been declining for the past three years. Last year, foreign investments in the country's free trade zones dropped by 12 percent, Costa Rica's daily La Nacion reported this week. Asked about these blows to the country's economy, Solis told me that the two companies themselves have said that their departure from Costa Rica is due to global strategic reasons, "and have nothing to do with my statements, nor my election, nor with Costa Rica's domestic market conditions." He added that the two companies had made their decision before the election, "but they preferred to wait until after the vote in order not to contaminate the electoral process with their announcements, which had a big impact." Now, Solis said he plans to travel to several countries with a group of business people as soon as he takes office to seek new investments. "We have also received news in recent days of new investments that will be coming, in amounts that probably will come close to the number of jobs that were lost after the Intel and Bank of America decisions." 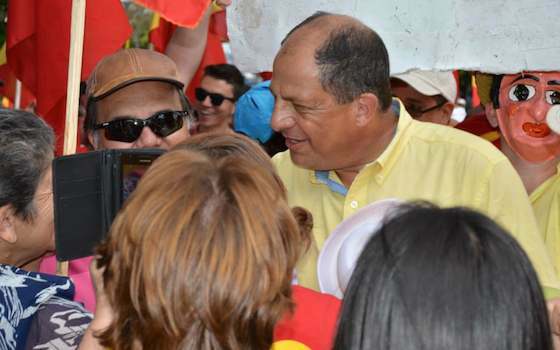 Solis is also likely to face political problems, as leader of a relatively small party that will only control 13 of the Costa Rican legislature's 57 seats. But he countered that no political party will have a majority in congress, which will force them to reach negotiated agreements. "Costa Rica is not ungovernable. It's a perfectly governable country, and will continue being that," he said. On other foreign policy issues, he said he will not seek to undo Costa Rica's free trade agreement with the United States, which he strongly opposed seven years ago, arguing that conditions have changed. He will, however, look into outgoing president Laura Chinchilla's decision to join the Alliance of the Pacific free-trade bloc made up Chile, Peru, Colombia and Mexico. He said he will decide whether to go ahead with it after studying whether it could hurt domestic producers in Costa Rica. Asked about Venezuela's political crisis, and whether Costa Rica will maintain its tradition of being one of Latin America's most vocal defenders of human rights everywhere, Solis said that "Costa Rica would make a big mistake if it moves away from its traditional (pro-human rights) position." He added, however, that as head of the regional CELAC group, he will have to be very "measured" when it comes to being a spokesman for that organization. When I asked him what he thinks about former Costa Rican President and Nobel Peace Price winner Oscar Arias' statement that Cuba is not a self-styled democracy, but a full-blown dictatorship, Solis said that "the Cuban government has been criticized, justifiably in previous times, for human rights violations, but I think that it's a government that today functions under conditions of much greater normalcy." On whether he plans to follow Uruguay's example to legalize marijuana, he said that would be "a bad idea" for Costa Rica, although he said he would welcome an open debate about marijuana legalization. At the end of the interview, I asked Solis who are the Latin American leaders he respects the most. His answer was, in that order, Uruguayan President Jose Mujica, and Chile's president Michelle Bachelet, both of them pragmatic leftist presidents. Most Central America experts I talked to speak positively of Solis, and doubt very much that he will embrace radical populist policies or support undemocratic governments in the region. "I don't think we will see major changes, neither in economic nor in foreign policy, because he won't have much wiggle room," says Manuel Orozco, a Central America expert with the Washington-based Inter-American Dialogue think tank. "Costa Rica has been growing at nearly 4 percent annual rates for many years, and he will try not to do anything that could put that stability at risk." Other emphasize that if Solis had not won, the country may have veered much farther to the Venezuelan-styled radical left. Solis' center-left party in effect siphoned off votes from the far-left Frente Amplio party, which advocated among other things for domestic price controls and closer ties with Venezuela, they say. My opinion: Solis is likely to bring a breath of fresh air to Costa Rican politics, which have been dominated by the National Liberation Party - with few interruptions - for more than six decades. There was a deep demand for change in the country, which the ruling political class was no longer able to address. I only hope that Solis will meet his word and maintain his country's tradition of leadership in the defense of democracy and human rights in the region. Some of the moderate leftist governments he admires, such as those of Brazil and Uruguay, have replaced the collective defense of democracy for the selective defense of democracy - denouncing abuses from right-of-center governments, while looking the other way to abuses from left-of-center governments. It would be sad if Solis would do the same. "Costa Rica's New Leader Says He's a 'Moderate' Leftist"